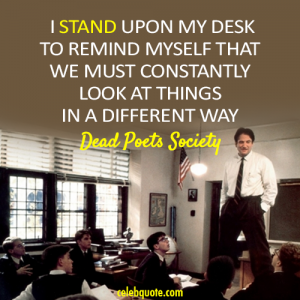 I’m sitting here writing today because a man stood on his desk in front of a classroom of skeptical teenage boys and gave me a new perspective. I was a junior in high school when I saw Dead Poets Society for the first time. I had always liked writing because it’s easy and fluid and emotional, but I never thought of it as such a gift. Poetry was all cutesy rhymes and writing was a necessity until I stopped and realized that language is everything – it’s how we relate to others, it’s how people form opinions, it’s how history is perpetuated. But Robin was more than just that one role. He’s Mrs. Doubtfire. He’s the guy from flubber. He’s Peter Pan. He was hilarious in terrible roles and moving in dramatic ones. He’s the best character in the only animated Disney movie I like. I remember telling my 12-year-old brother a few months ago that Aladdin is the greatest Disney movie of all time because of Robin’s character. He did not know who that was, and my heart sank. I know that pop culture trends come and go and that one was before my brother’s time, but Robin Williams is one of the most influential personalities I’ve ever encountered. And I hope generations to come remember the incredible character he was. He is, above all, funny. He made people laugh. And though he was most popular before I started consuming media, I know that he had a checkered past. He struggled with addiction and depression and had even recently spoken about overcoming his illness. He was, in appearance, a strong man. But all strong men falter. And there I was, a junior in college, sitting in a coffee shop with my best friend back home, the sky gray and hopeless and filled with rain as it has been for days, when a USA Today notification popped up on my phone alerting me that Robin had passed. I tucked the incredibly realistic pain that seemed to come from such a silly thing – the death of a celebrity I’ve never met and would never be able to meet anyway – away. 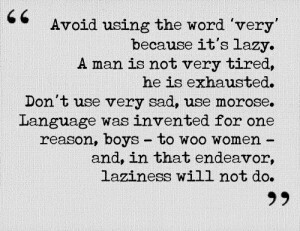 And here I am, writing to let it all out, to express my passion, with the word “very” absent from the whole article. I worry so much, as someone who considers herself a part of the comedic community, that the depression that comes from detailed observation of the world and a dedication to making people laugh will drag me down and make me forget to laugh myself. But there’s so much beauty in the world. There are Robin Williams movies to cheer you up and more movies like that to be made. There’s more to life and more to living, but that’s a different article. If I can make one plea to the reader, though, it is that you respect mental illness. Depression is as real and as dangerous as a physical disease. If you are suffering from depression, don’t be afraid to look for help. And don’t be afraid to talk about it. Getting rid of stigma starts with us. Oh Captain, my Captain, farewell. 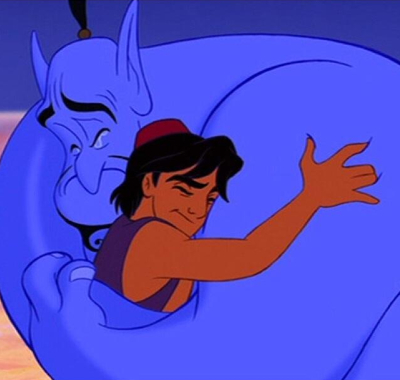 It’s so incredibly sad to know that a man who brought us so much joy and laughter was plagued by such a crippling depression. We can only hope that he’s at peace now and that his death will shine light on how we handle mental illness.